When we first reimagined the ring by adding a chain instead of the rote band, the biggest obstacle presented itself to us early on: the clasp. Clasps are tough: They’re the source of chipped nails, finger cuts, and a general sense of overwhelming frustration. We didn’t want any of that to be part of our customer’s experience, so we broke it down to the basics: what is a clasp? A link that looks similar in design to other links in the chain but differing in function. A link that has a mechanism for opening, latching on to a loop ring, and closing. Seems like a pretty broad definition, right? 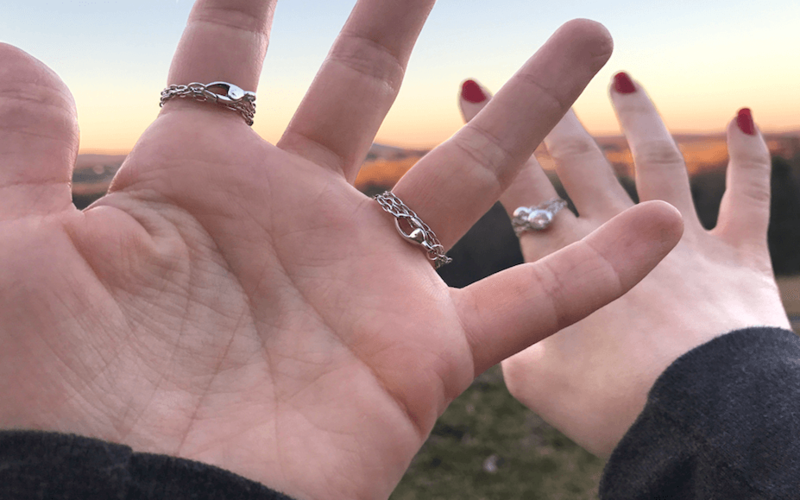 Yet clasps by and large have remained the same: a broad loop allowing the chain to bounce around and a tiny trigger to open the clasp that doubles as a tiny little knife on your finger. Down with the circular clasp, we say! Instead our rounded clasp comes to a point at the end, so your ring stays in place instead of shifting around. Additionally, we’ve done away with the traditional trigger. This makes it a tad harder to put on, but once you’ve got the hang of it you can say goodbye to nicked fingers and dangerous handshakes.